Updated with additional information about Correa’s administration and exposés in the Panama Papers scandal; scroll down. 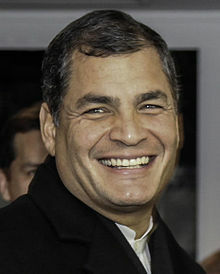 Ecuador’s president Rafael Correa has published a significant statement about international tax governance, and specifically the prospect of creating a global tax organisation. This is particularly important, given that Ecuador has just assumed the presidency of the G77 group of developing countries. “A rapidly growing global web of tax havens is one of the key drivers of this inequality . . .
No one country can tackle this complex, secretive global financial conspiracy alone. Coordinated and comprehensive global action is needed. Current moves towards greater transparency about the initial owners of money held in shell companies can be part of the solution, but modest efforts at achieving greater transparency are not enough. We need to scrap tax havens altogether. That is why I decided to join hundreds of other economists to sign Oxfam’s open letter calling for an end to the era of tax havens. That is why we need to work along with important NGOs that have been at the vanguard of this struggle, in order to continue building global consciousness on this crucial issue. And that is why at the UN General Assembly this week, Ecuador will be pressing for the creation of a UN body capable of calling time on this scandal. This will not be an easy struggle. We are already seeing much resistance. The boycott by a number of wealthy countries of the tax justice agenda during last year’s UN Finance for Development Conference in Addis Ababa was a stark reminder of the opposition and shameful arguments we will confront in pursuing this cause. The idea of having an international tax organisation is an old and honourable one, dating back to the time of Vito Tanzi. (We’ve written a fair bit about this: see here, and Eurodad’s document An Intergovernmental Tax Body: why we need it and how we can get it. The basic idea of a global tax body is that better co-ordination and co-operation can help solve many problems in international tax. The body currently attempting to play this co-ordinating role is the OECD, the club of rich nations: a state of affairs which of course isn’t ideal for developing countries, since many of the key issues in international tax involve thorny questions about how to allocate taxing rights between countries – and developing countries are the losers. Correa’s article contains several other points of note, such as a planned referendum in Ecuador on whether or not to allow public officials to hold assets in tax havens, which we already mentioned. “Ecuador’s referendum follows on from our extensive efforts to transform our country’s tax system and clamp down on tax avoidance. That is impressive. We’ll try and bring further details. “There are times when developed countries engage in hypocrisy. . . . Tax havens are not necessarily sunny Caribbean republics. On the contrary, the vast majority are under the jurisdiction of the richest countries. Moreover, contrary to the widespread idea that they are places to conceal money, they are more likely to be platforms for operating financially and commercially in the global capital markets. Update: Some important context for Correa’s speech. Several Ecuadorian high profile politicians and government officials were exposed by the Panama Papers, including President Correa’s cousin (who was also president of Ecuador’s Central Bank), and the Attorney General, who’s still in position. Independent media does not appear to be operating freely in Ecuador, either, with, according to one estimate, 450 sanctions taken against journalists under Ecuador’s Communication Law. See, for example, Ecuadorian President Attacks Journalists over Panama Papers, and other reports concerning repression of freedom of expression in the country detailed here.